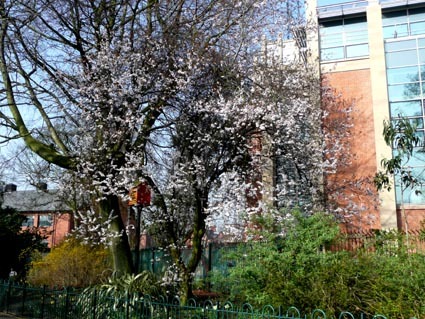 This plum discovered by and named after Monsieur Pissard, gardener to the Shar of Persia in the 1880s, is widely grown in Ireland for its spring blossom.It can look glorious in March and April when in flower, but has a rather somber appearance later in the year with its dark purplish leaves and black bark. Described in one book thus "for the rest of the year it is a twiggy mess, worst in summer when bearing muddy brown 'purple' foliage". Some authors clearly don't like it! 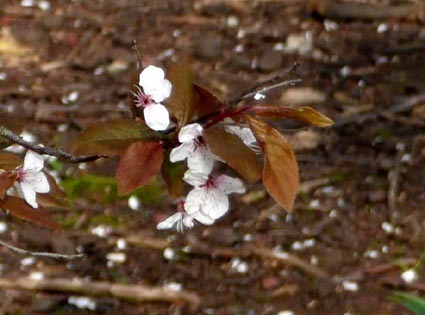 The flowers are pink in bud and open to almost white, contrasting well with the emerging reddish leaves. 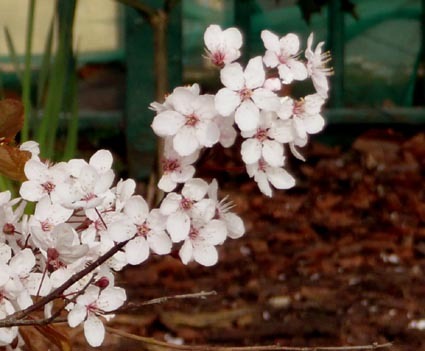 Previously given its own species (P. pissardii or P. atropurpurea) is is now classified as a variety of the Myrobalan plum (the cherry plum) which is native to Iran, although widely naturalised in the UK. Its flowers are typical of the rose family with a large number of stamens, five petals and 5 sepals.